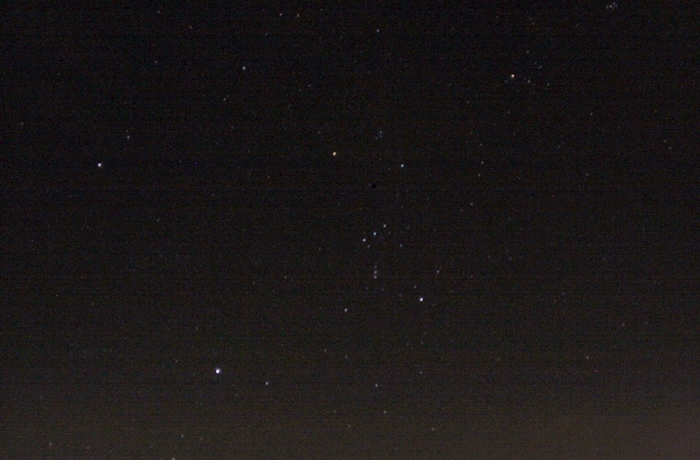 This photo features Orion, a familiar constellation, not as you’ll see it with your eyes, but as it can be captured using state-of-the-art “amateur” equipment. 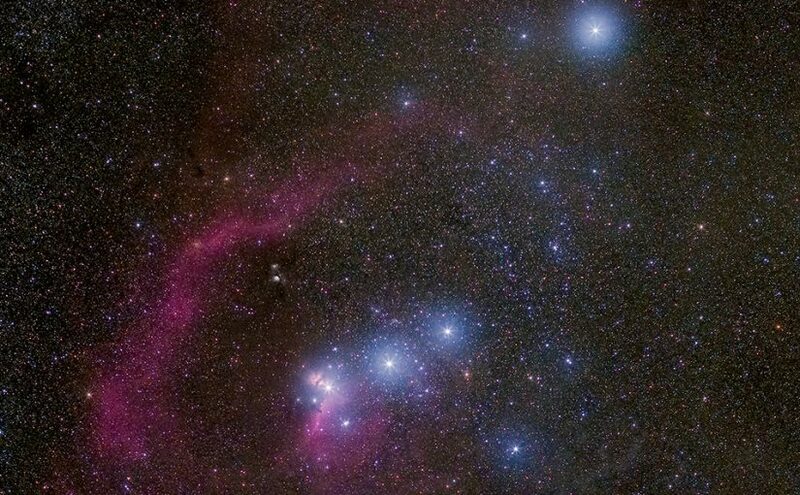 It is titled Camera Orion and won Astronomy Picture of the Day (APOD) on March 21 of this year. The image is ©2018 by Derrick Lim, who graciously allowed me to use his photo in this post. You can see more of Derrick’s outstanding work on his Facebook page. It’s often said that the current state of amateur astronomy rivals what professional astronomers at observatories were doing a century ago. Mass production of equipment that was formerly custom-made (including observatories) has lowered the entry cost for the hobby. If you spend some time browsing through the APOD archives you’ll see what today’s “amateurs” are achieving. The image is a 4-panel mosaic taken using a modified Sony A7S coupled to a Canon 85mm f1.8 lens set to f4. Each panel is a mean stack of 20 images, with an image exposure time of 30s at ISO 2000. A Skywatcher Star Adventurer mount was used to track the stars during exposures. This image was taken from the province of Nakorn Ratchasima, Thailand. The skies were estimated to be around Bortle 3. There were some high clouds that night and relatively high humidity. Both factors contributed to the bloated stars effect in the photo. Interestingly, some astrophotographers employ a soft light filter, normally used for portraits, to soften an image and intentionally create bloated stars. This technique was popularized by Japanese astrophotographer Akira Fuji back in the good old film days. Akira’s images frequently appeared in Sky and Telescope magazine. 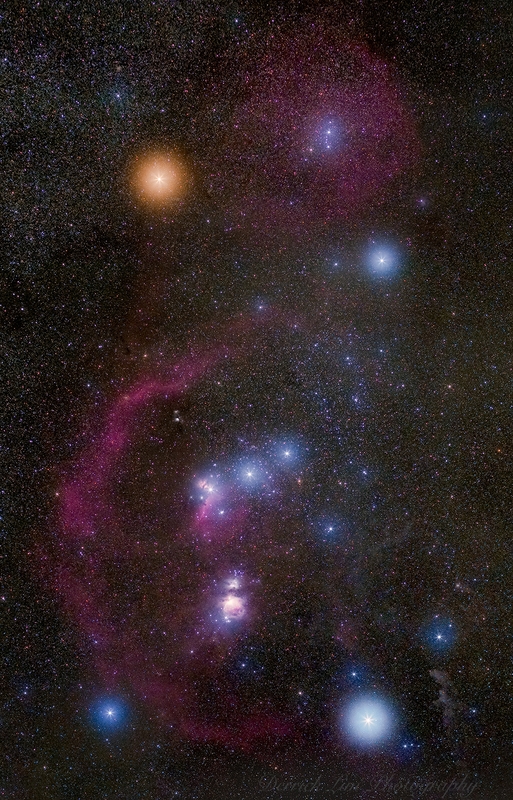 I captured this image of Orion sometime around 1985. It was one of my first attempts at astrophotography, using a Pentax K2 with a stock 28–135 mm Zeiss lens, and a tripod mount for stability. The film (yes, film) was Ektachrome 1600, then popular for astrophotography. Exposure was at ƒ/2.8 for 1 second. At the time, I was quite proud of this photo. It does show the primary and belt stars, as well as M42, and you can see the reddish tint of Betelgeuse, but the bluish stars are washed-out white (except for a few blue pixels in Rigel and Sirius). All the stars are compact dots with little blurring, so that’s good. But there’s not even a hint of Barnard’s Loop, and there’s only a tiny fraction of the background stars visible in Derrick’s image. You might also notice some sky glow at the bottom from light pollution over Phoenix. So why did I subject myself to this embarrassment? About the only thing the two photos have in common is the subject — hardware, exposure, FOV, and processing were all vastly different. It’s like comparing the proverbial apples and oranges. My intent was simply this: to show how far amateur astronomy has come in the last 30 years. But it gives me pause to speculate … what will we be seeing on APOD 30 years from now? Since 1985 I’ve learned a lot about astrophotography, both online and by experiment. I’m still a long way from Derrick’s level, but I’ve captured a few images worth sharing. The best are on the Astrophotos page of our Desert Foothills Astronomy Club website. None of them have appeared on APOD, though you’ve seen a few in Sky Lights.